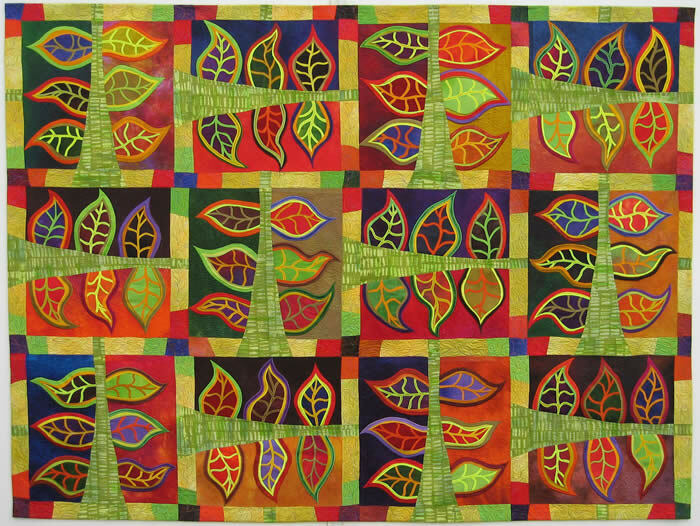 I visited the Schweinfurth Memorial Art Center for the Quilts=Arts=Quilts exhibit this past weekend. The show runs until January 9, 2011 and I really hope that I get to go back again. Why? There are 88 quilts in the show and it is a bit overwhelming to take it all in during one visit. Each and every quilts deserves attention. I found the exhibit intriguing on a number of levels. As a metaphor, an onion comes to mind - except for the tears! The more you walk through the exhibit, the more you see in terms of levels of analysis and experience - a bit like an onion that comes apart in layers revealing more and more aspects of its being down to a core. 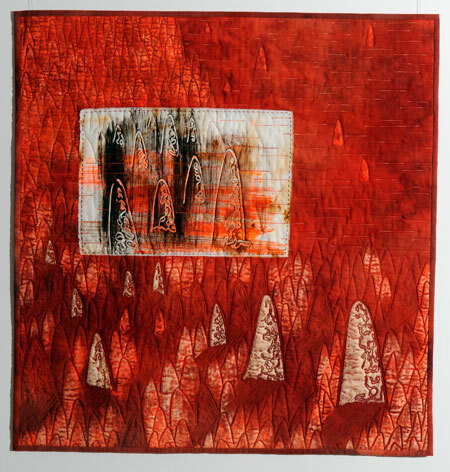 If I had to use one phrase to describe the art quilts in this show, it would be technical mastery. The stitching in each piece was impeccable. At times, in fact, I felt overwhelmed by the perfection. I had to keep stepping back and getting beyond technique to take in the compositions displayed. It was at this level that I could appreciate the diversity of the works. There were abstracts, landscapes and portraits. I would look across a room and notice the use of contrast to draw the eye - but then be drawn over to a piece that didn't use contrast at all. What fun! 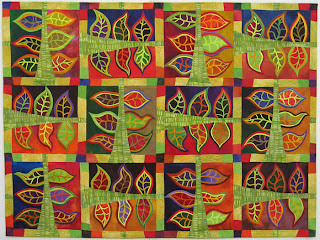 Similarly, there were many very linear quilts, but just when I would think this predominated the show, I would begin to notice all the beautiful curvi-linear pieces. There was indeed diversity of fiber - silk, cotton, wool, velvet, canvas, and linen to name a few. Many works used hand-dyed fabric but when I searched, I could find some that were all commercial cottons. There were some digital prints and quite a bit of hand painting. Viewing the exhibit from another perspective, there were pieces representing artists from around the world. All of this diversity left me intrigued about the jurors themselves. I didn't envy their task. I found myself wondering at times exactly what went on in their minds - in a good way, of course - as they made their selections. They had managed to represent many different facets of art quilts - was that intentional? There was such perfection in the stitchery that I began to wonder what didn't get in. Were there some rejections that were equally intriguing but perhaps less rigorous in rendition and therefore rejected? I am not even sure if that makes sense but it was fun to ponder it. I almost wish that there had been a folder of the rejects to glimpse at so I could have grasped a better understanding of why these particular quilts. I guess the final layer for me as I peeled back my 'onion' of experience of the show was perhaps what touched my core, or heart. Every piece in the exhibit was, as I said earlier, awesome in a technical sense. My favorites, I think, spoke to me in a way that allowed me to go beyond awe at technique and enjoy their subject matter. Finally, though, there were a few that touched me at a deeper level, in my heart. From the moment I walked in the show, I wished I could meet the men portrayed in Flight Crew by Kathleen Mc Cabe as I was drawn to them. Randall Cook's Tangled Timbre captured my imagination and sent me off pondering the story of those limbs. And, then over in a corner, was Hallowed Ground by Cathy Stechschulte and Paula Swett of Lewisburg, PA. There was no statement with the piece that I could find but the geographic location of the artists brought me to an interpretation of the piece that it honored the memory of those that died on 9/11/01. That touched my heart in yet another deep and profound way. So, there you have it, my personal take on the show. 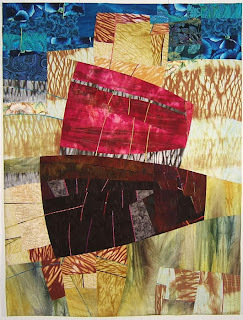 If you live nearby, I hope you will take the time to visit Quilts=Arts=Quilts. I am sure you will find plenty to admire and to like. If you are unable to visit, then I hope you have the good fortune to visit another art quilt show soon and that it takes you on a similar journey of appreciation and challenge.